Definition of a bad day can be going to the dentist, and they inform you that you need an implant, or worse multiple. Next they tell you that it will cost you about $3,000 to $5,000 per tooth. There goes the vacation plans that year. So you came to this page to see what options you have for finding inexpensive, reasonably priced dental implants. First let’s go over the various scenarios. This dental surgery is used under the following conditions. General Information about getting this procedure. Dental implants will affect one or multiple teeth and have no effect on surrounding areas. 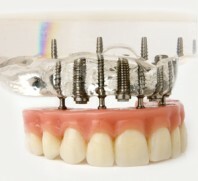 Implants will secure a bridge or dentures so that your bridge/dentures become semi permanent. You have a choice that you should be aware of when budgeting as most dentists will not offer both types, and that will affect your price. Affordable dental implants are almost always the Endosteal type, see below. To understand the two variations, see the table below. This type is surgically placed in the jawbone using special medical grade screws or cylinders. One endosteal dental post is capable of holding multiple teeth. This is the most common form used in modern dentistry today. It can be used for either single crown attachment or for any form of bridge or denture. The subperiosteal dental surgery version is secured on the surface of the jaw using a titanium metal framework. The posts go into the gum, after it is able to bear a prosthesis. Typical this is used for patients that have more extensive bone loss. It is a more difficult dental surgery. Advantages, the screw type posts tend to be faster and much more affordable. This is a more expensive dental surgery. This is considered a dated model, to a degree. Other Implant styles you should understand to make the best choice. The traditional process with time frame, and the dental surgery involved. Day one Your oral surgeon, not the dentist will cut back the gums to gain access to the underlining bone. He will then drill a tiny hole between 4-7 mm and insert a hollow dental post. Normally made from titanium. After around a two to about a four-month time frame your jawbone will grow into the post causing to to become stable and ready to receive the male port of the implant that the crown will go on. The Dentist will drill a tiny opening in the gum and jaw bone and once the correct depth and angle are achieved they will insert a tiny titanium post that looks almost exactly like a hi-tech screw. Once the high tech screw has been installed a temporary tooth will be placed on the titanium post. The tooth will be made to be smaller than the space occupied by the previous tooth. This will help to keep the new post from being put under undue pressure. This entire dental surgery process takes 25 minutes. Affordable dental implants are always the screw post type. for at least the first thirty days. Raw foods like celery would need to be avoided coming in to contact with the new implant. After one month you return get your permanent crown. This really is the best method of replacing missing teeth. Something noteworthy about the screw type posts is that if you suffer from bone loss this implant can be set at an angle often bypassing the need for painful and expensive dental surgery for bone grafting. This fact alone can save you thousands of dollars in your search to get a cost effective dental implant option.